By the way, a project does not have to last days or weeks. I like mini-projects (some might call them activities) that can be done in a day or two, especially for smaller topics or for younger students. The very best thing about projects is that they are flexible. Well, that and I find that projects help increase engagement and interest in the subject! Please let me know in the comments if you try any of these ideas because I'd love to hear how it went! "I Spy" - Write a script of two visitors to Minoan Crete playing the game "I Spy." Then get with a partner and actually play the game. Example: "I spy, with my little eye, something dangerous...Is it bull-leaping? Yes!" Minoan Charades - Play charades by acting out something the Minoans were known to do. Your partner, group, or the whole class guesses what it is you are doing. Try to stump them! No speaking! Use your body to show the concept...If you are able and allowed to, record it and see if other classes can get your charades! 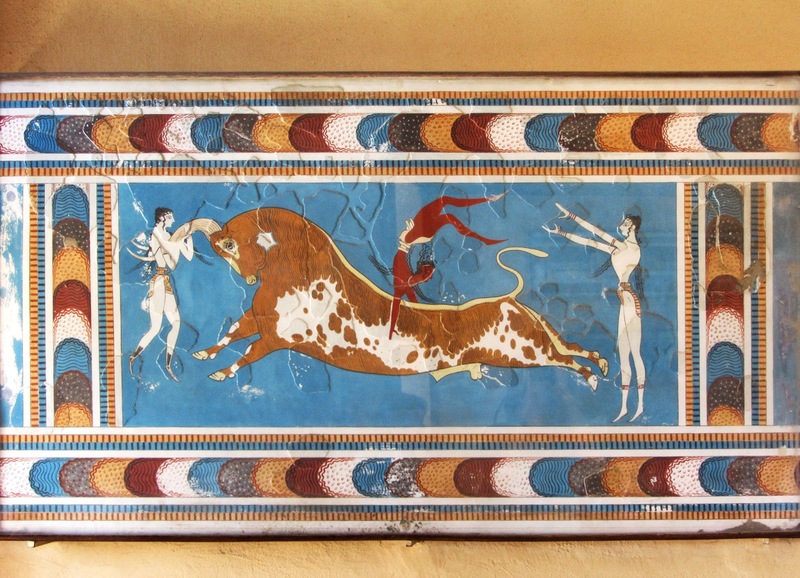 Minotaur's Labyrinth Museum - Create the plans, a diorama, or a model for a museum on the Ancient Minoans. Include lots of facts and details about the Minoans and their way of life. You could make the layout a maze like the Minotaur's maze! Or not...You decide! In might be fun to also include a snack bar and gift shop stocked with cool stuff to help others learn about the Minoans. The View from Mount Juktas - Study photos of Mount Juktas and the view from there. Draw a scene from Mount Juktas in Minoan times. What would a Minoan have seen from there? What was the importance of Mount Juktas to the Minoans anyway? Minoan Trade Game - Find out what the Minoans traded and with whom they traded. Create a trade game to simulate it. It could be a card game, a board game, or some other concept. Crete, Home of the Minoans - Make a detailed map, model, or other representation of Crete. Present it to the class. Be sure to discuss how the Minoan's geography impacted their way of life. Those Minoans - What if you were an Ancient Mesopotamian or Egyptian and you visited Crete and saw the Minoan civilization. What would you think? Write a report or create a presentation to tell the folks at home about those Minoans. Consider illustrating it too. 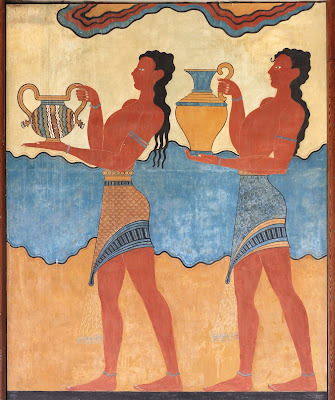 Maybe make the Minoans a fresco showing something from your civilization! Minoan Sea Chanty - The Minoans were excellent sailors. They had to be! Write a sea chanty - a song sung by sailors - about the homeland, Minoan life, etc. Give it a beat you can work to! Simulate the Thera Eruption and its Effects - Learn all about the eruption of Thera (called Santorini today) and the theories about how the eruption may have brought down Minoan civilization. Then, simulate it. You could make a working model, create a computer animation, act it out with people. There are a million ways to do it! Have fun! Be creative!